The book started off quite interestingly but I soon got bogged down on the first few chapters about the First World War. I am not a fan of writings or documentaries or movies about wars and combat and so I got on quite laboriously in the beginning. I was however very adamant on reading this book about my two all-time favourite authors and if I had to read about wars, I will have to read about wars. And I am glad I did. This book is exceptional. Very few books made me cry, and this one did. 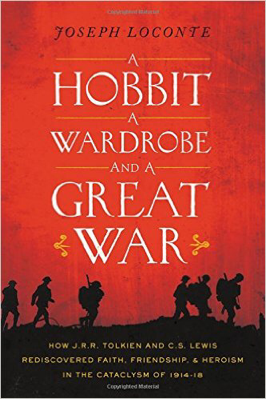 It spent quite a bit of time to discuss the war that both Tolkien and Lewis were in. It was an important factor, if not one of the most, that influenced their writings. Winston Churchill said that this "Great War differed from all ancient wars in the immense power of the combatants and their fearful agencies of destruction, and from all modern wars in the utter ruthlessness in which it was fought." I wouldn't know about Churchill's comment about future wars, what with the environment we are in right now, and we are not even at war, but I can see how the conditions that they had to encounter during the First World Wat were so bad. But what is interesting though is this, before the Great War, society then in America and Europe, was living in an era of the myth of progress. They have had so many breakthroughs in mechanicals and technologies that they look to a world of perfection and goodness and peace. Then came the war. With this, I can also see that we might be in the same myth of progress where we are now, and we need to be warned before we fall into its trap again. Loconte then proceeded on to tell the story of how Tolkien and Lewis met after the war, and this part of the book warmed my heart. It is a delight to read how they met every week to discuss their thoughts and ideas, and how they read their writings to each other for comment and critique. It was in such a setting that Tolkien and a friend helped Lewis worked out his logic and thinking to believe in God and Jesus as his Saviour. And it amazes me that it had to do with the theme of myth. Lewis said the understanding of the nature of myth was crucial to his conversion. The subsequent section of the book is now my favourite of all in books I've ever read, which I believe I will read again and again. I have practically highlighted almost every other sentence in the paragraphs. Loconte provided me with a better background and perspective which I will take to when I re-read The Lord of the Rings and when I get into The Chronicles of Narnia. Their experience in the war, and the atrocities they have lived in, they have looked at it as the struggle of human against evil and the clamor for power, which is evident in the stories they told. Their heroes are unlike the heroes of our day. We look up to the heroes who are the only ones who can save the world, whereas the heroes of these two gentlemen are men who struggled with the weaknesses and yet gain victory not really by their doings, but through the most unexpected means. And on top of it, it is not us human that gains the ultimate glory of victory. In all wars or conquests that we see, victory was short-term if not futile. We await for the Return of the King, and only then will it be truly and finally victorious.